Los Angeles Chargers quarterback Philip Rivers is quite familiar with injury, but it’s not due to his own injuries. Philip Rivers’ has had an almost comical amount of injuries to his offense, from ex-running back Danny Woodhead’s ACL tear to his #1 wide receiver Keenan Allen missing two years in a row due to a lacerated kidney and ACL tear, respectively. 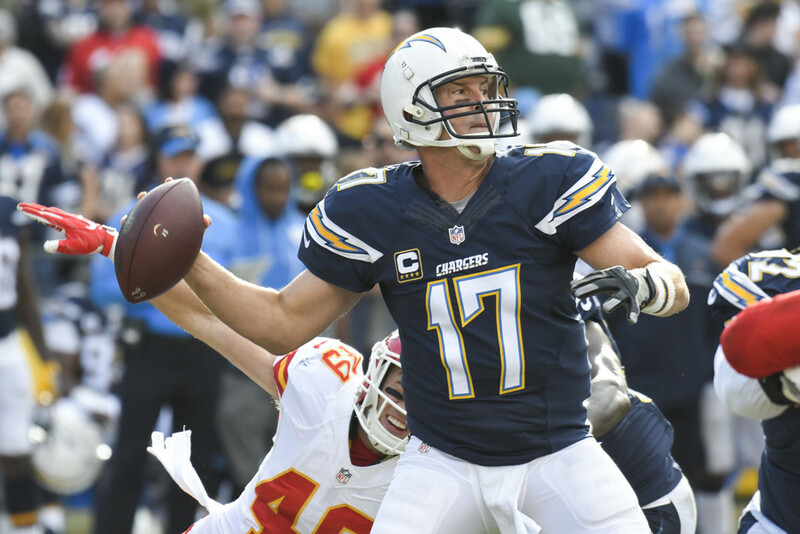 Even with a depleted offense, Rivers had a solid 2016, completing 349 passes out of 578 attempts (60.4%) for 4,386 yards, 33 touchdowns, and 21 interceptions. He added a miniscule 35 yards on 14 rushing attempts. Rivers did not get a rushing touchdown. In standard scoring leagues, Rivers finished as the 14th ranked quarterback. This performance was slightly underwhelming when looking at his 2016 ADP, where he was drafted around 8.11, or the 11th quarterback off the board. This means in many 1 quarterback 12-team leagues, Rivers was probably taken to start on a fantasy team. Those who drafted Rivers probably felt disappointed last year based on his fantasy finish, but Rivers actually performed a little better than his mean, which is about 4153 yards and 28 touchdowns over 11 seasons since becoming the starter. Rivers did throw more interceptions in 2016 than usual too. Rivers is currently sitting at an average draft position of 9.12 overall in 12-team standard mock drafts. Rivers is the 13th quarterback off the boards. 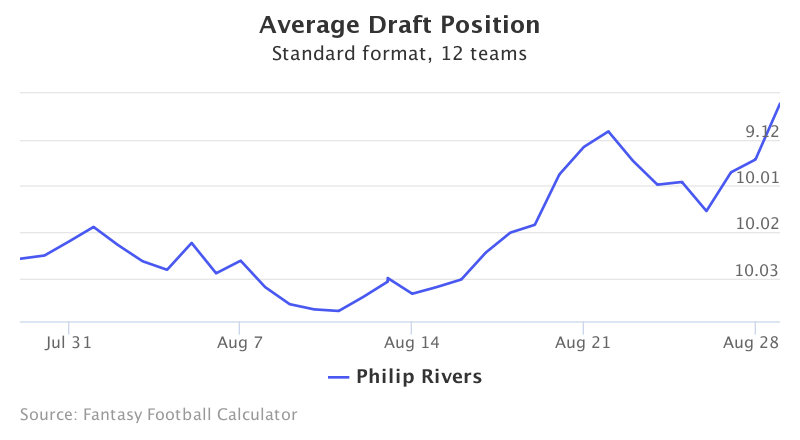 Over the past month, Rivers’ ADP has remained constant, hovering around the early 10th round. His worst ADP was at 10.03 in early August. Nothing exciting has come out of the Chargers’ camp, so fantasy owners are aware of what to expect from one of the longest tenured quarterbacks in the NFL. Will the Injury Bug Finally be Squashed in LA? Philip Rivers has seen so many wide receivers come through the doors that he probably has trouble remembering them all. Hopefully the Chargers will have consistency this year so Rivers can build some chemistry with his receivers and eliminate the high amount of interceptions. So far, no big injuries have hit the Chargers. Running back Melvin Gordon has helped take some of the pressure off of Rivers as well, showing he is capable of catching passes when Rivers has to get rid of the ball quickly. If Keenan Allen can stay healthy, Rivers should have a relatively decent year and should easily outperform his current ADP. Rivers played all 16 games since he took over the starting role in 2006. There is no real injury risk here. Philip Rivers is currently being drafted at 9.12 in 12-team standard mock drafts, good for a high end QB2. Rivers finished last year as the 11th ranked quarterback, slightly outperforming his 14th quarterback ADP in 2016. If you plan on drafting a quarterback late in the draft, Rivers is a good target. He throws a lot, scores a lot of touchdowns, and should have an even better year with Keenan Allen healthy. Look for Philip Rivers to finish the season once again as a mid-lower end QB1.